The only thing better than wasting my time playing videogames is wasting my time drawing comics making fun of videogames. Yup, I’m living the dream. It would make more sense if you switched the axes (or flip the curve on its side). With Time as the x axis, you’re saying the amount of extra time needed to be invested from one type of game to the next gets smaller. Dude I totally agree, however, this format represented the best way to display all the data in a compact, readable way. I know it’s a bit of a cheat, but the curve is more of a visual aid then a hard data construct. Next time I’ll be more careful! And the axes are not bad if its on a logarithmic scale, but I know thats what you did from the start! And nice depictionof the target demographics for each style if gaming! Thanks! I tried to represent the worst embodiment of each genre, hopefully no one was too offended! What type of strategy game? Like an RTS? haha yes absolutely, MMO’s are the final form of RPG’s. THEY RANGE IN DIFFICULTY TOO MUCH ALSO I DON’T REALLY LIKE THEM UH OH I SAID THAT. Your family knows what’s up! I haven’t had much experience with StarCraft unfortunately, but I’m glad to know the MLG shirt makes sense in that context! Yea, like StarCraft or Red Alert. Whoa Technicolor Long Neck! Glad you liked the strip! I concur with this logic. And what would be your example of a “good” RPG. Who said the person at the top was a guy???? Hmmmm, not sure what you mean by Action and Adventure games, most games I’d lump under that category I’ve played tend to start getting enjoyable pretty fast, the enjoyment just might kinda fall flat before the end because of repetitiveness. 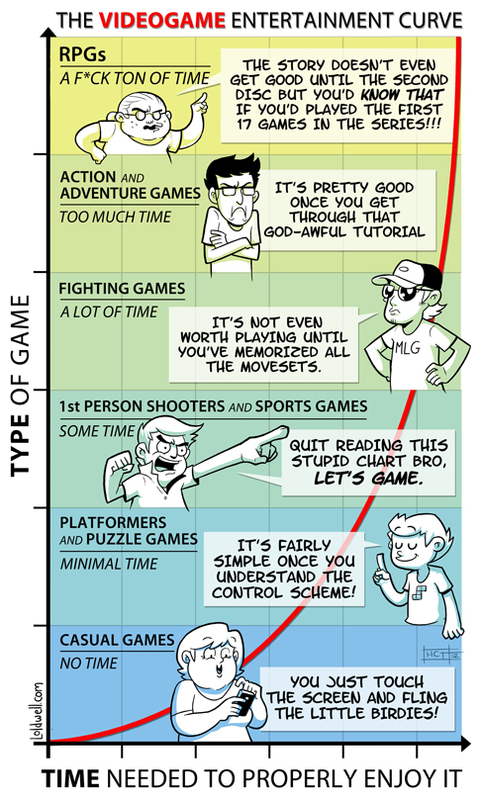 Nice graph, but I think you mean Action Adventure games, not Adventure games. Most adventure games are with a point and click gameplay, which are very easy to pick up and enjoy, like casual games or platformers.